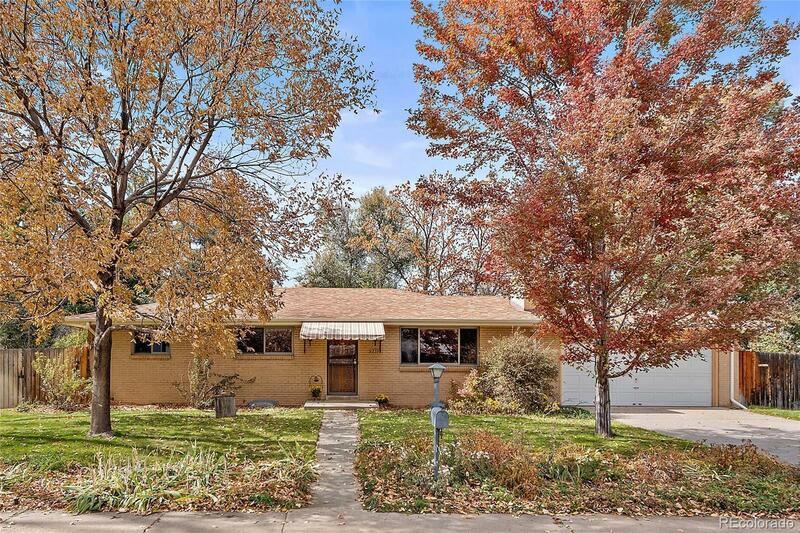 BEAUTIFUL BRICK RANCH IN A QUIET, PEACEFUL NEIGHBORHOOD ON A GORGEOUS, TREE LINED STREET ONLY ONE BLOCK TO THE LIGHT RAIL STATION IN THE HIGHLY COVETED LAKEWOOD HIGH SCHOOL DISTRICT! HOW MANY TIMES HAVE YOU WISHED FOR A HOME WHERE YOU CAN DO EXACTLY WHAT YOU WANT TO IT AND LIVE THERE AT THE SAME TIME?? WELL, TODAY IS YOUR LUCKY DAY!! THIS HOME IS ROCK SOLID, WITH 5 BEDROOMS(2 NON-CONFORMING), 2 BATHROOMS AND AN AMAZING BACKYARD WITH ONE, EXTREMELY RARE SHARE OF DITCH RIGHTS! THE SPACIOUS FRONT ROOM HAS A WOOD BURNING FIREPLACE, LARGE PICTURE WINDOW AND THE BEST PART OF ALL, ORIGINAL HARDWOOD FLOORS UNDER ALL THE CARPET! SEPARATE DINING AREA WITH A SLIDING GLASS DOOR OUT TO THE COVERED PATIO! EAT IN KITCHEN WITH AMPLE CABINET SPACE! 3 BEDROOMS UPSTAIRS AND ONE FULL BATH WITH A DOUBLE SINK! DOWNSTAIRS HAS AN EXTRA LARGE FAMILY ROOM, TWO NON CONFORMING BEDROOMS, 3/4 BATHROOM, LAUNDRY ROOM, WORKSHOP & TONS OF STORAGE! THE GIANT BACKYARD HAS A COLORFUL GARDEN & A CONVENIENT STORAGE SHED!